Lightly coat 2 large ramekins and a mini donut pan with nonstick olive oil spray. Set aside. In a medium bowl, whisk together strawberry gelatin with 1/4 cup boiling water until gelatin is dissolved. Add 1/4 cup vodka. Pour into one of the prepared ramekins. Refrigerate until firm, about 1 hour. 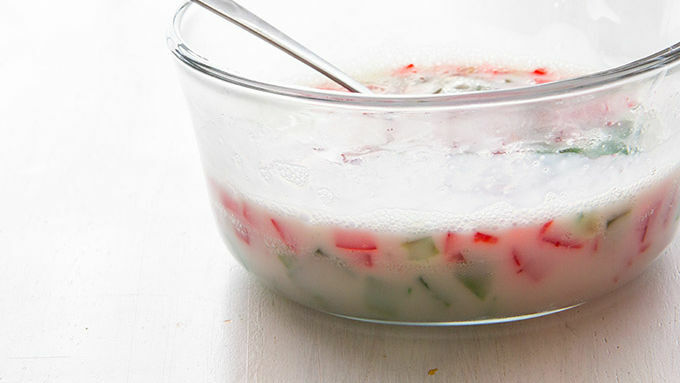 In a medium bowl, whisk together lime gelatin with 1/4 cup boiling water until gelatin is dissolved. Add 1/4 cup vodka. Pour into the second prepared ramekin. Refrigerate until firm, about 1 hour. Once the strawberry and lime gelatin have firmed up, prepare the final gelatin layer. In a large bowl, whisk 1/4 cup of boiling water into the unflavored gelatin until gelatin is dissolved. Add 1/4 cup vodka and the sweetened condensed milk. Whisk until smooth. Place in refrigerator for 5-7 minutes while you prepare the stained glass layers. 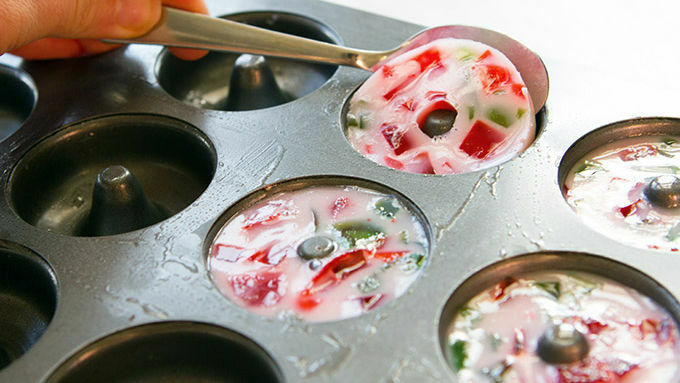 With a sharp knife, cut the strawberry and lime gelatin into tiny (1/4-inch by 1/4-inch) cubes. Remove the cubes with a spoon. Once the white gelatin layer is cool, gently fold the strawberry and lime cubes into the white gelatin. Don’t over mix, or the red gelatin will turn the white layer pink. Spoon mixture into the prepared donut pan. Refrigerate until firm, about 1 hour. Remove by gently loosening each wreath from the donut pan with a spoon. Serve chilled. Garnish serving platter with fresh mint and cranberries, if desired. Special equipment needed: Mini donut pan. An edible holiday cocktail that's all about holiday spirit. Know how they say Santa’s laugh is “like a bowl full of jelly?” Yeah, yeah. We know he laughs like a jiggly, jelly shot. And we’re about to turn your holidays into the merriest, brightest, and booziest season yet with these Santa-approved jelly shots! 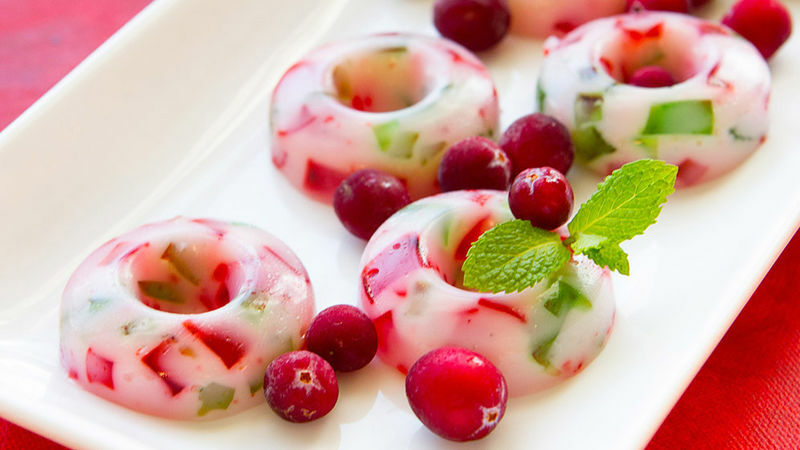 I decorated my plate with fresh mint and cranberries, but you could also find sugar bows in the cake-décor aisle of your local craft store – an adorable way to make these jelly shots look like little wreaths! Then all you gotta do is find a few friends to get jiggly with – Merry Holidays!